Prince William and Kate Middleton announced their engagement after a long relationship. The wedding date is set for April 29th, 2011. The 28-year-olds got engaged last October while on holiday in Kenya. The event promises to be well-celebrated in England and indeed around the world. After all, we're promised a public holiday! We can't help but celebrate. The kind of celebrations expected for this latest Royal wedding is unprecedented. Let's see how Prince William's own grandmother, Queen Elizabeth 11 celebrated her big day. 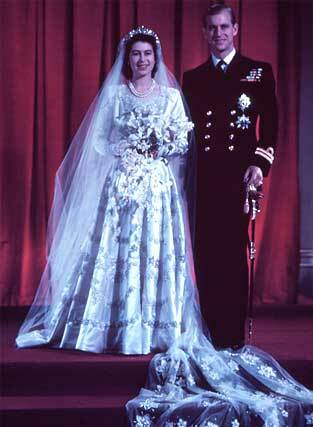 The Queen wore this wedding gown when she was 21, in 1947. It was designed by Norman Hartnell and embroidered with 10,000 seed pearls. It sports a 13 feet train, fit for royalty. Imagine how many people you'll need to hold onto that! And here is Her Majesty wearing the dress. The Queen's wedding shoes. Not only are they beautiful, They look comfortable as well. During their (The Queen and Prince Philip's) 60th anniversary, both Her Majesty's gown and wedding shoes were placed on display. There were also several commemorative pieces created especially for this event. William and Kate souvenirs have hit the market in a massive wave. If you're a fan of Royal weddings, now is the time to get yours. Although mugs seem the favourite keep-sake at this present time, I'm sure there will be other options to choose from as the wedding gets closer. We've seen the large amounts of royal memorabilia available on the market, both for Charles and Diana and Her Majesty the Queen.